viaLibri ~ Armenia and the Near East. Armenia and the Near East. London: George Allen & Unwin Ltd.,, 1928. Octavo. Original green cloth, title gilt to spine. Frontispiece and 16 other plates, folding map, headpiece, plans to the text. Spine a little tanned, light toning, else very good. First edition in English, originally published in Norwegian in the previous year. 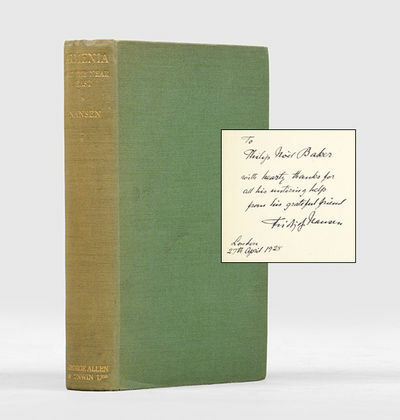 This copy inscribed on the front free endpaper: "To Philip Noël Baker with hearty thanks for all his untiring help from his grateful friend Fridtjof Nansen, London, 27th April 1928." Relates to Nansen's last, and perhaps most problematic humanitarian effort on behalf of the League of Nations, the attempt to save the refugee remnant of the Armenian people, and the establishment of a homeland for them within Soviet Armenia. The plan was never implemented, but the Nansen International Office for Refugees later settled some 10,000 in Erivan and 40,000 in Syria and Lebanon. The recipient, Philip Noël Baker, came from a Quaker family, his father was a Liberal MP and prominent peace campaigner. During World War I, Noël Baker served with the Friends' Ambulance Unit in France and his "political background and wartime experiences produced a strong commitment to international co-operation and disarmament. He was a member of the British delegation to the Paris peace conference and then worked with the League of Nations secretariat until 1922. From 1923 to 1924 he was secretary to the British delegation to the League of Nations, working closely with Edgar Cecil. Subsequently he was private secretary to Charles Alfred Cripps, the minister responsible for League of Nations affairs in the Labour government of 1924" (ODNB). It was Noël Baker who secured Nansen's original appointment as high commissioner with responsibility for post-war exchanges of prisoners of war, he "was eager to boost the League's reputation after the American Senate had rejected US membership. The League needed to be able to point to concrete results, which Noël-Baker believed Nansen would be able to deliver" (nobelprize.org). On hearing of his nomination for the Nobel Peace Prize in 1922, Nansen wrote to his friend, "If our work is worthy of it, you would have deserved it much more" Noël-Baker was himself awarded the Nobel peace prize in 1959 for his work towards disarmament. A superb association copy, from one Nobel laureate to another.